WHITE DOO-WOP COLLECTOR: JOHNNY ANGELS... Who Is Johnny Angel? JOHNNY ANGELS... Who Is Johnny Angel? Above the two young men who recorded under the name of Johnny Angel. Left Johnny Angel aka Mike Russo from Philadelphia and Right Johnny Angel from Gallup in New Mexico. -Starlight/The Story Of Love. Power Records-1958. -We're Old Enough/Where's My Love. Jamie Records-1959 (as Johnny Angel & The Creations). -Lonely Nights/Seven Words. Jaf Records-1961. -Without Her Heart/Lady of Spain. Felsted Records-1961 ( as Johnny Angel & The Halos). -One More Tomorrow/Mashed potato. Felsted Records-1962 ( as above). -Looking for A Fool/Roller Motion. Felsted Records-1962 ( as above). -This Is The Night For Love/You've Been Wrong. Swan Records-1966. The mystery of the two Johnny Angels!!! Love it......hopefully somebody out there can shed some light? 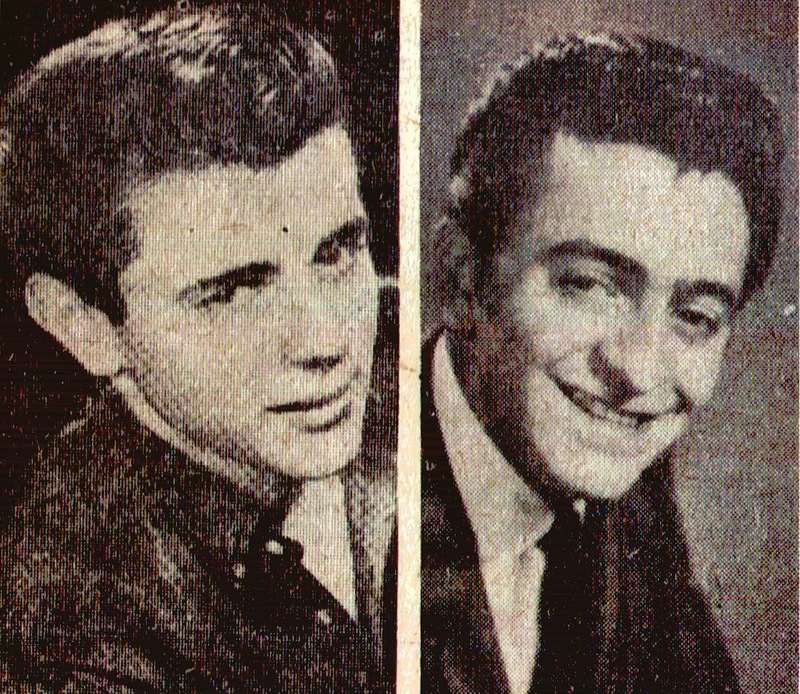 The "Johnny Angel" on Felsted, who recorded, "(If I Had)One More Tomorrow", which was co-produced by Gary Paxton, was actually a, Angelo John Spezze, who was a co-producer of the song as well. I've read others say that Angelo John Spezze isn't the same individual, but I believe they are the same exact person. I've read where they claim that a Kenny Ancel was "Johnn Angel", but the two vocalists don't sound like the same individual to me. Besides, take the names, "Johnny Angel" and "Angelo John Spezze" does no one see similarities ? Roland is correct. The Felsted titles and the Imperial Records title listed above are all Angelo John Spezze. He was my uncle. Kenny Ancell was my brother. They collaborated on many records from the late 50's through the 60's. They are both deceased now, both dying at very young ages (my uncle was 41, my brother was 47). My family and I have tracked down over 50 titles that they recorded. Angelo John Spezze had other pseudonyms besides Johnny Angel (Aldo Hubbins, Tippy Larkin, The Pharmaceuticals, maybe a couple others). Kenny Ancell also recorded a few records under the name Kenny Shane.